The husband and wife duo, Joey + Rory, have won over a legion of country music fans with their appearances on CMT’s Can You Duet? competition show. Reportedly, their love of traditional leaning country music and for each other was very palpable throughout the weeks on the competition. Both Joey Martin and Rory Feek have had successful careers apart from their more recent musical partnership—Rory a successful Nashville songwriter (“Chain Of Love, “How Do You Get That Lonely”, “Some Beach”, “You Can Let Go”) and Joey a successful restaurant owner with Rory’s sister. While the duo may have only finished in third place on the CMT show, they have signed a record deal with the highly esteemed Sugar Hill Records. As someone who did not catch any of the episodes of Can You Duet? at the time of their airings, it was the news of their deal with Sugar Hill Records that, ultimately, caught my attention. To me, Sugar Hill represents music with integrity, which is exactly what makes Joey + Rory’s debut project such a pleasant success. On the softer side of things, “Sweet Emmylou” is a gorgeous song that tastefully name checks Emmylou Harris while “Loved The Hell” plays with the phrase “I loved the hell out of him”, which both refers to unconditional love and spiritual rebirth. “Rodeo” is a plea from a woman to the Rodeo to let go of the stronghold that it has on her man. She laments, “If you were just another woman, maybe I’d know what to do/He might give his heart to me, but he’d give his life for you.” Finally, the title track is a heartfelt tribute to the significance and power of a song, which is a fitting way to end the album. Joey, who provides the lead vocals, has both a strong and sensitive voice somewhat reminiscent of a young Wynonna Judd while Rory, her willing side man, provides gentle harmony vocals that quietly, but effectively, supports and blends well with his wife’s. 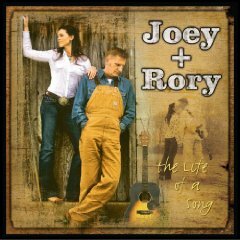 While not all of the songs on the album are written by them, Joey + Rory have demonstrated their keen ability to both write and select quality songs. This culmination of substantive songs with memorable melodies , along with the tastefully soft acoustic productions, certainly gives this record the integrity worthy of a Sugar Hill Records release and will, no doubt, land somewhere on my top five albums for 2008. Sweet review, as always. I personally wouldn’t rate it this high, but I think you highlighted a lot of why this album succeeds when it does, and why they’re such a breath of fresh air. I think my main problem with the album is the glut of songs that personify specific objects (“Boots,” “Sweet Emmylou,” “Rodeo,” the title track), most of which I find kind of uninteresting. I guess I have trouble relating to their subject matter, which might be why most of the themes in them sound forced to me. The only one of that ilk that I really like on the album is “Heart of the Wood,” which I think succeeds because it tells a very specific story in a very specific way, so even an outsider can understand its significance. That’s just my opinion, though. And that said, there are lot of tracks here that I really love – “Play the Song,” “Cheater, Cheater,” “Heart of the Wood,” even the cover of “Free Bird” (I have to be in right mood for it, but it’s solid). So I still think they have oodles of talent and potential. But I have to say, I really wish Rory would have sung lead on some songs, as I think that would have given it all a better sense of balance, plus he just sounds like a great singer. But anyway, it’s a good start for them. I’d give it a 4 after a first listen through.. it’s simple but effective. We’ll see how long it gets rotation on the ‘pod. unpretentious as a pair of old blue jeans…. nicely deviated from conventional sounds. Nice piece, Leeann. When release week came and went without a review, I thought maybe we wouldn’t be seeing one from you after all. Glad to finally read your thoughts and find that, once again, we basically agree… right down to the star rating. 3.5 stars. Although Joey is designed to be the “star”, I would’ve appreciated a little more Rory. Carl Jackson’s subtle production is terrific, and the standout tracks outweigh a couple clunky moments (for example, “Boots”). Having seen them live, I can say they are the real deal. CMW, you’re the man!! It’s fun agreeing with you all the time. I really should have reviewed it sooner, but life got away from me. I toyed with 4 stars, but settled on 4.5 because I really like the album that much. I, too, would love to hear more Rory next time around, but I’m not complaining about hearing Joey, because I love her voice. It’d be cool if they did a Kasey Chambers and Shane Nicholson kind of thing and shared lead vocal roles rather than one doing all of them. I do think Rory harmonizes very nicely with Joey though, so their choice of Joey being in front and Rory playing a supporting role isn’t a complaint for me. I’m just glad we hear Rory and that he’s not interchangeable with any random good harmony singer. I’d notice, I think, if they switched him out for someone else, which is something I can’t say for Brooks And Dunn. I love this album. “Heart of the Wood” is one of the coolest turn of a hook I know of, in my opinion. But then, im a sucker for coming in with that christian sentiment at the end. I love this duo. They put the old style COUNTRY back into Country Music. I too would like to hear a bit more from Rory. But I would be content to see this couple make it past the one hit wonder stage. Looking forward to the next album. How great to hear a genuine Country Album, from a fantastic duo. Their success proves that there is an audience for True Country Music. It seems that the music Executives miss the fact that Genuine Country Music has marketability. Talented singers and musicians, like Joey and Rory, will find they have the most devoted of fans who will always be there to support them. This fan for life can’t wait for the next album!! I love them! Joey is beautiful and love her voice while Rory is handsome and they make an awesome couple.I love the fact everything about them is real,romantic just down to earth and they dont act like they are better than you are. Keep up the good works guys.